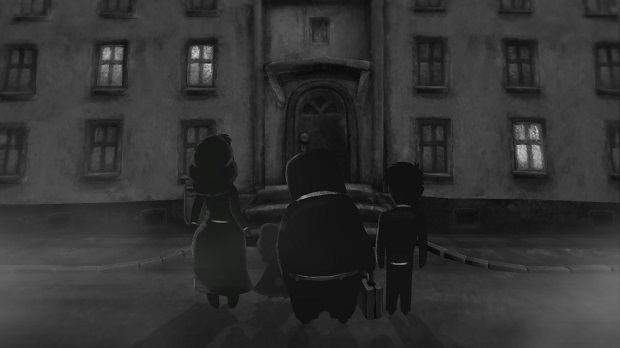 Dark and engrossing, Beholder takes a realistic look at life in a totalitarian state. Do you perform your job as assigned, look out for your family first and foremost, or undermine the establishment by any means necessary? Though you may try to balance them all, there’s no way to protect everyone. Lives will be lost and good people will be jailed along the way. Carl Stein has been called upon by the Ministry of Allocation to act as the new landlord for an apartment block where the previous overseer was arrested for crimes against the state. Carl and his family move into the basement of the building, and he’s given experimental drugs that suppress his need for sleep so he can complete his duties at all hours of the day. Somehow you must figure out how to provide for Carl’s wife Anna, his daughter Martha and son Patrick; but you’ll find out quickly that that’s much easier said than done. Your assignments start out slow and reasonable. First, you must stealthily install cameras in common areas and the residents’ apartments. Be mindful of one man in particular, as the government suspects he’s up to no good. When you catch his drug-making on video, you send the footage to the Ministry and promptly get him locked up. That introductory quest is about as cut-and-dry as it gets. Beholder was built to be a game of choices, so there are many different ways you can play and endings you can get. However, you can’t help everyone. Each decision you make has an impact. For example, would you rather shield your tenants from the government and assist them in fleeing the country, or steal their belongings so you can pawn them off for your child’s hefty medical bills? Much of the game is spent sneaking into apartments and rifling through people’s possessions. Submitting profiles on everyone living in your block will earn you a bit of cash, but the Ministry has urged you to immediately report any illegal items or activities. This seems simple enough in the beginning, until you realize that new government directives are issued multiple times a day, criminalizing everything from owning blue jeans to crying in public. But those things should be harmless enough, right? You’re forced to determine how much of a government slave you’re capable of being, as well as how desperate you are to feed, clothe, and cover up for your family. You can only lose the game through death or embezzlement, both of which are more likely than you might think. Picking the wrong conversational response with a resident could result in a gun to your head, and unexpected fines from the state have a way of cropping up at the worst possible moment. If you run out of money to pay, they won’t hesitate to throw you in jail. Not to worry, as most of the time you can restart from your last autosave and correct your mistake. Beholder strikes me as a combination of the moral dilemmas in Papers, Please and the art style and time management of Fallout Shelter. I really love the graphics, as the nearly featureless silhouettes capture the feeling of residing in a totalitarian state, where individual people don’t matter in the face of the national machine. The game music is perfectly dramatic, reaching crescendos when a tenant is evicted or you’re caught conspicuously peeking into someone’s wardrobe. A few sound effects have been scattered through the gameplay, such as mumbling character voices, knocks on doors, and food being prepared in the communal kitchen. The audio leveling isn’t the best in places, making these sounds occasionally obtrusive, but overall they fade nicely into the environment. Another sign of a lack of polish is residents sometimes getting stuck in their doors after you have a conversation with them at the apartment’s threshold. However, in spite of these small nitpicks and a couple of loading hitches, I thoroughly enjoyed my time with Beholder. It’s easy to get lost in a string of quests, scrimping and saving for one problem just to be blindsided by the next. Between getting killed or arrested and discovering new endings, I’ve started multiple new games, and each 2-3 hour playthrough had something different to offer. I imagine it would take quite a while to uncover all the grim secrets this game holds. Beholder is a management sim and a moral quandary all in one. It’s easy to become consumed by the lives of Carl Stein and the apartment dwellers he’s been hired to spy on, with a story full of twists, turns, and terrible fates.